Charles Bigelow is a contemporary American type historian, professor and designer, recipient of a MacArthur Grant in 1982. 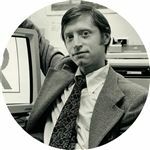 He was a professor of Digital Typography at Stanford for several years. He runs the Bigelow & Holmes studio with partner Kris Holmes. Their most significant work is probably the Lucida font family, which is creditied with being perhaps the first serious attempt to make type look good on low-resolution output. Lucida’s accompanying pi font, Wingdings, has long been included with Windows.